Established in 1808 and Incorporated in 1913. D. Napier & Son Limited was one of the most important aircraft engine manufacturers in the early to mid-20th century. Napier engines have been used in multiple aircraft, including widely deployed fighters. Their post WWI Lion aero engine was the most powerful engine in the world into the 1930s, and their Sabre could produce in excess of 3500 hp. The first aircraft powered by the Sabre was the Napier-Heston Racer, which was designed to capture the world speed record. — still a shadow of its real ability, for it was known to be capable of a sustained 3,750bhp. This is a real blueprint, expertly restored from original plans and vintage design drawings. — measuring a generous 42"x 30". Sabre-II aircraft engine - The Sabre was installed in a number of experimental aircraft and went into two production aircraft. Both were fighters built by Hawker: Typhoon and Tempest. — becoming the fastest of all the Allied low level fighters. Continued from above… the world, especially for inline designs, developing over 3,000 horsepower (hp) in its later versions. The Napier Sabre represented the ultimate in piston engine technology, not only in the 1930s when it was conceived, but even by today ?s standards. It was a truly remarkable engine, representing the ultimate in complexity, technology, specific power. The Sabre was another of Frank Halford engines, brilliantly conceived in the mid 1930s, the Sabre was also based on the H-configuration driving two crankshafts. The Sabre deviated in a number of significant ways from the Rapier and Dagger. The cylinders were oriented horizontally rather than vertically, which offered an even more compact engine package for close, tight cowling. Limitations of air cooling, particularly for a high-performance in-line engine, became very apparent with the Dagger. 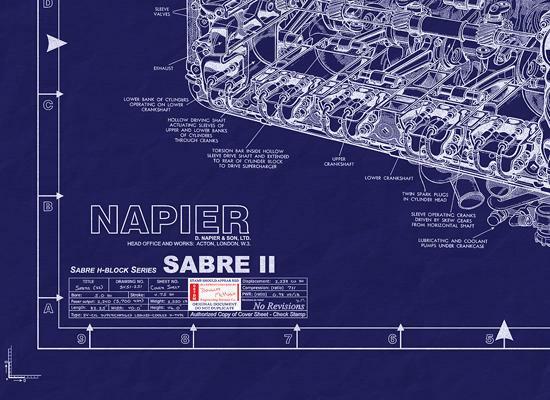 Consequently, liquid cooling was incorporated into the Sabre design, which not only offered improved control over the considerable heat rejection requirements, but allowed closer cylinder spacing, which in turn resulted in a still more compact engine. Of the many problems suffered by the Sabre, perhaps the primary one was the use of sleeve valve technology. In order to improve the volumetric efficiency, sleeve valves were employed because of the limitations of poppet valves, even in four-valve form. Napier Sabre engine above -- Four banks of six cylinders, with a 5.0-in bore and a 4.75-in stroke, resulted in a 2238-in3 displacement, coincidentally almost identical to the Rolls-Royce Griffon's 2239-in3 displacement -- that was the only similarity between the two engines. The two-piece, vertically split cast aluminum crankcase supported the two six-throw crankshafts, which, as in previous Halford H engines , rotated in the same direction. Although slightly improved primary balance may have been achieved through counter-rotating crankshafts, the propeller reduction gear design dictated this scheme. As it was, the Sabre was a remarkably smooth running engine. 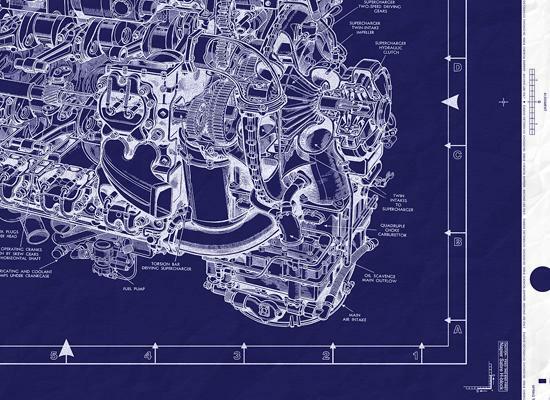 Early engines featured twelve first-order counterweights for each of the two crankshafts. From the Sabre V on, it was found they were not necessary, and therefore they were eliminated, resulting in a significant weight savings for these two components. Seven main lead bronze bearings supported each of the crankshafts. The Sabre V and all subsequent engines incorporated thin-wall strip bearings manufactured by Vandervell, who in the 1950s designed, built, and sponsored the Vanwall Formula One race cars.  herein lay the secret to the Sabre's tooth load balancing system . The upper and lower pairs of pinions were connected with a centrally pivoted balance beam. Preloaded volute springs acted on the ends of the beam against the pinions, thus ensuring that the helically cut pinions would float along their longitudinal axis as they transmitted the considerable power of the Sabre and guaranteeing equal tooth loading. Even though the Sabre was beset with numerous problems as will be related, reduction gear problems were nonexistent thanks to this very innovative piece of engineering. Propeller shaft radial loads were handled by massive roller and ball thrust bearings mounted back to back, the latter also taking care of propeller thrust loads. In addition, a plain bearing was mounted at the rear of the propeller shaft that also transmitted oil to the de Havilland constant-speed propeller. The sleeve drive mechanism showed similar ingenuity. Two hollow longitudinal shafts, driven from the front, drove the sleeves of the upper and lower cylinder banks. Each shaft, supported in 14 plain bearings, was split in the center and coupled with a flange. Six skew gears, integral with the case-hardened sleeve drive shafts, drove six ball-bearing-supported bronze wheels with two sleeve drive cranks phased at 180?. These drove the upper and lower sleeves with ball joints. Each sleeve drive assembly was pressure lubricated from the low-pressure side of the lubrication system. Sleeve design followed Roy Fedden's concept at Bristol, featuring a chrome molybdenum steel nitrided forging with two inlet ports, one exhaust only, and a common port for both intake and exhaust. Cylinder block cores on the Sabre engine also followed Bristol practice with a three intake and two exhaust port design. In an effort to control high oil consumption, especially when sleeve wear became excessive, helically cut slots were incorporated into the lower sleeves. Each cylinder had a removable head that incorporated the junk head, combustion chamber, coolant passages, and the two centrally located spark plugs. A single piston ring in the junk head sealed against combustion gas pressures. Six ejector-style exhaust stacks fitted on each side of the engine discharged the exhaust, each stack fed from one upper and one lower cylinder. Conventional forged steel blade-and-fork connecting rods , machined and polished all over, were used on the Sabre. Big end bearing technology was again similar to the crankshaft bearings; they were thin-wall lead bronze inserts with a lead flash. A similar bearing surface on the outer central portion of the shell offered a bearing surface for the blade connecting rod, and thus the bore of the rod was the bearing journal. Supercharger drive , always a major design challenge due to the high rotational speeds, high loads, and torsional vibration, was solved in the Sabre in typical innovative Napier fashion. The hollow sleeve drive shafts contained long, torsionally flexible quill shafts running coaxially with the sleeve drive shafts. Drive originated at the front of the engine and terminated at the rear behind the crankcase. The step-up gears for the two-speed supercharger had their drive transmitted by cone clutches mounted outboard of the supercharger impeller in an arrangement similar to that found on an air-cooled radial rather than on a liquid-cooled in-line. Separate discharge volutes, flowing from the supercharger housing, fed each of the four cylinder banks. 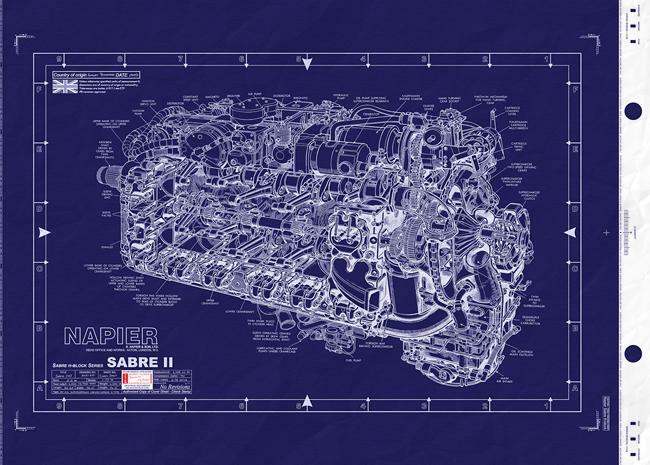 To improve the flow characteristics of the Sabres' supercharger , a double-entry, two-sided impeller was used, fed by a four-barrel SU carburetor, two barrels feeding each side of the supercharger impeller. Two large accessory drive locations were provided, one on top and the other on the bottom of the engine. The upper location provided drives for the Coffman starter, vacuum pump, hydraulic pump, Heywood air compressor, supercharger oil pump, distributor, magnetos, generator, ignition servo unit, and propeller governor. The lower location provided drives for the oil pumps?pressure and scavenge?and the dual coolant pumps. Coolant flow was a prodigious 367 gal/min with an outlet temperature of 115 to 130?C. Oil flow was 41 gal/min with a maximum outlet temperature of 95?C. Starting the Sabre was accomplished by a Coffman cartridge starter , which unfortunately contributed to the Sabre's woes. At the time of its development, an electric starter of sufficient power was not available in England. The Coffman offered several significant advantages, such as lower weight and a smaller battery that yielded additional weight savings. On the down side, the vicious acceleration imposed on the engine when the cartridge was fired could cause considerable damage. During the firing stage, the starter developed a momentary 25 hp. Therefore it was imperative that all engine controls were correctly set when firing the starter. Over-priming was the cause of many problems resulting in sleeve damage and seizure caused by the lubricant being washed off the cylinder walls, and in severe cases hydraulic lock could result. Several schemes were incorporated to alleviate these problems. To ensure adequate lubrication of the sleeves during the critical starting phase, fuel for priming was drawn from a small tank housed in the wheel well of the aircraft. The priming "brew" consisted of 30% lubricating oil and 70% fuel. In cold conditions, the "two-shot" starting system was used. This entailed firing one cartridge with the magnetos turned off but with the primer on. A second cartridge would then be indexed around and fired with the magnetos hot and hopefully a successful start would result. The starter contained five cartridges, and if all five were fired without a successful start the engine required a lengthy maintenance procedure, including the injection of oil in all 24 cylinders through the spark plug holes. Shock loading from the starter also caused sleeve drive shaft failures until this part was strengthened. The Sabre was initially manufactured in Acton, a suburb of London, and a shadow factory was later set up in Walton, near Liverpool. Although the engine successfully passed its type test in June 1940, problems started to bubble to the surface as soon as volume production started. At the time, it was not only the world's most powerful aircraft engine, but also the most complicated, and in many areas not only advanced the state of the art for high-performance engine design but in manufacture as well. This established the scene for an unfortunate set of circumstances that were never satisfactorily resolved. The result was Napier's being absorbed, in December 1942, by the English Electric Group. 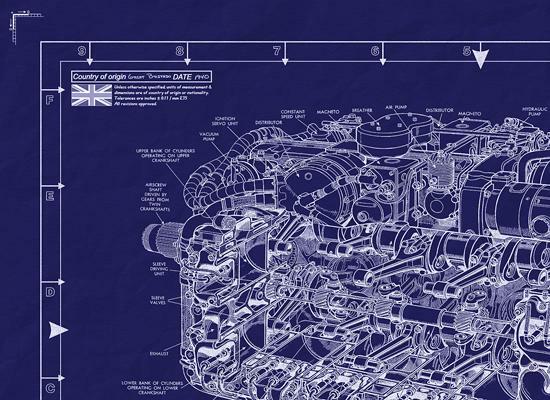 The engines used for the type test had been hand built, hand fitted, and carefully assembled by top craftsmen. Production engines on the other hand did not have this luxury, resulting in many mechanical problems, particularly as the engines entered squadron service. The majority of the problems centered on the sleeves and sleeve drives. As Bristol had found out to its chagrin, sleeve engines are a very different proposition to manufacture from their poppet valve counterpart. Circularity of the sleeve and the fit of the sleeve to the cylinder were just two of the critical parameters that needed close attention. Sabre sleeves were manufactured from a nitrided chrome molybdenum steel alloy forging. It was found that after final grinding of the exterior and the bore up to 0.010 in, out-of-roundness resulted. This in turn would cause sleeve seizure and/or loss of compression. Several "fixes" were attempted, including?because of its excellent bearing characteristics?silver plating of the sleeve. The Royal Air Force was committed to the powerful Sabre engine ; therefore a tremendous effort was expended in getting the engine right. After the English Electric takeover, Rod Banks of Schneider Trophy fame took over the development phase. By sheer coincidence, the Bristol Taurus shared the same cylinder bore of 5.0 in with the Sabre. Banks put plans in place to test the Sabre using Bristol Taurus sleeve material, tools, and manufacturing techniques. The overwhelming success of these tests prompted Banks to have Bristol manufacture Sabre sleeves. Amazingly, the Bristol company objected on the grounds that their sleeve manufacturing methods were confidential and refused to cooperate. Furthermore, Napier thought the idea not worth pursuing. To put things in perspective, it should be noted that at that time, early 1943, the war was far from won, and it is hard to believe that the British could have afforded this kind of corporate infighting. Common sense prevailed, and Sabre sleeves were manufactured from nitrided austenitic forgings using Bristol tooling, making a major contribution to saving the Sabre program. Because of the critical nature of the Sabre program, some high-level wheeling and dealing took place. When centerless grinders were desperately needed for sleeve production, six Sundstrand grinders were diverted from their intended destination at the new Pratt & Whitney plant in Kansas City, Missouri, for R-2800 C series production and sent to Liverpool instead. Needless to say, Pratt & Whitney was miffed to be the victim of this international maneuvering. Again, Rod (later Air Commodore Rod) Banks was responsible for manipulating the Sundstrand grinder deal; the fact that his boss at the time was Lord Beaverbrook, Minister of Aircraft Production, obviously helped. Even with the improved manufacturing techniques, plus numerous design refinements, the engine was not out of the woods. It has been documented that the Sabre suffered the dual evils of being a very complex product manufactured by a company hard-pressed to deliver under difficult wartime conditions. Cases were cited where poor workmanship contributed to the already bad situation: improperly cleaned castings, broken piston rings, and machine cuttings left inside the engine. When the engine reached squadron service, there were cases of ground maintenance personnel misadjusting the automatic boost control, allowing far too high a manifold pressure at low rpm and resulting in detonation and consequently serious engine damage. Because of the grave consequences of this unauthorized meddling and the sensitive nature of the Sabre program, court-martials resulted from this action. After the issues of the early Sabres, the engine became reliable and increasingly powerful. By 1944, in Sabre V form, it became an excellent power plant. Several of the improvements incorporated into the Sabre V were relocating the outboard, overhung supercharger clutches to behind the crankcase, thus reverting to conventional in-line configuration. The double-entry, two-sided supercharger impeller was replaced with a single-sided impeller. Carburetion was improved in 1942 with the introduction of the Series IV, by replacing the four-barrel SU unit with a Hobson-RAE single-point fuel-injection unit spraying atomized fuel into the eye of the now single-sided supercharger impeller. The Sabre VII was similar to the V; the primary difference was the use of ADI and strengthening of internal components. The VII represented the pinnacle of not only Sabre development, but the development of production aircraft piston engines. From its 2238 in3 (36.7 L) displacement a phenomenal 3500 hp was achieved at 3850 rpm with 70.6 in Hg manifold pressure. Finally, Napier test-ran a Sabre at 4000 hp with ADI. No other production aircraft piston engine has ever equaled these truly impressive numbers. Discussions were entered into for manufacturing the Sabre in the United States. Although the U.S. manufacturers were impressed with the design, they felt it was so different in construction from what they were used to that it was doubtful it could be manufactured in useful numbers prior to the cease of hostilities. — work includes: presenting aviation & military history; using todays technologies to preserve the past.